New feature in v11.7: Uncovers data quality issues, and establishes a remediation plan using metrics aligned with your business objectives. 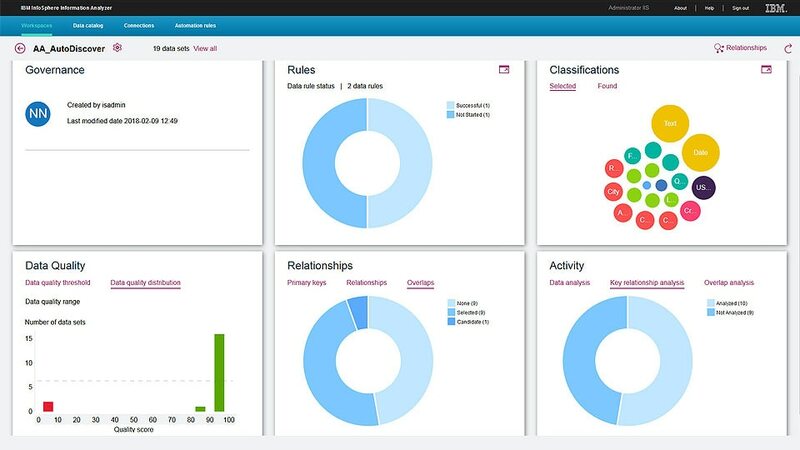 Helps you manage a data governance program. Matches records to eliminate duplicates, householding and many other operations. Helps to maintain an agile, business-focused environment to customize data standardization processes for your business needs, such as data enrichment or data cleansing. Offers data validation features including a flexible output table configuration for data validation rules, sequencing and impact analysis. Identifies where personally identifiable information (PII), sensitive and other classes of data are stored. Can identify the type of data contained within a column using three dozen predefined data classes including credit card, taxpayer IDs and US phone number. Enables you to create and customize three types of data classes: valid values list, regular expression (regex) and Java class. Allows you to limit the distinct values that are stored, which can reduce the size of the results database (IADB). Provides improved scalability for cross domain and foreign key analysis. The algorithm does not require a full column analysis with capture of all distinct values. Supports data profiling, classification, investigation, standardization, matching, survivorship, address verification and monitoring directly within a Hadoop cluster. Also supports USAC and AVI address cleansing and validation running on the Hadoop cluster. Includes Oracle Connector certification for IADB. Lets you transition into a private or public cloud with flexible deployment options and subscription pricing. Enables you to extend your on-premises capacity, or move directly to the cloud. Realize faster time-to-value, reduce administration costs and lower risk subscription pricing.